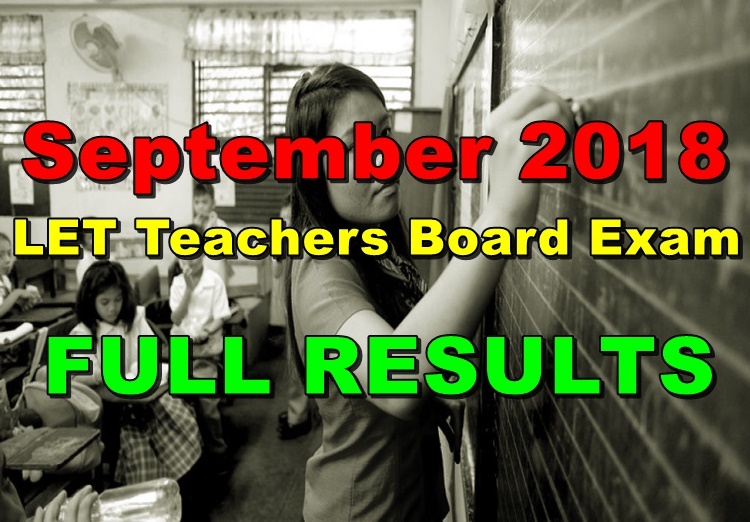 The Professional Regulation Commission (PRC) released the full results of LET Teachers Board Exam Results September 2018. PRC issues the list of passers, top 10 passers, top performing and performance of schools for LET Teachers Board Exam Results. The LET board examinations have been administered by PRC Board of Professional Teachers headed by its Chairman, Dr. Rosita L. Navarro, Vice Chairman Dr. Paz I. Lucido, and its members, Dr. Paraluman R. Giron, and Dr. Nora M. Uy. The licensure examinations for aspiring teachers have been given at PRC testing centers in Antique, Baguio, Bacolod, Batanes, Cagayan de Oro, Catarman Northern Samar, Cebu, Davao, General Santos, Iloilo, Laoag, Legazpi, Lucena, Rosales, Pangasinan, Tacloban, Tuguegarao, Pagadian, Zamboanga and additional testing locations at Oriental Mindoro; Kidapawan, Cotabato; Occidental Mindoro; Masbate City; Romblon; Palawan; and Catanduanes on September 30, 2018. The full list of passers for the teacher’s licensure exams are expected to be released within forty-four (44) working days after the last day of examinations or on Tuesday (December 4, 2018). The exam results might be released earlier or later without prior notice. sana mkapasa ang kpatid..ung name nia start with. A.A..
She is past in exam or not?